Have you ever seen a perfume prettier than one that has sparkles swirling inside?! 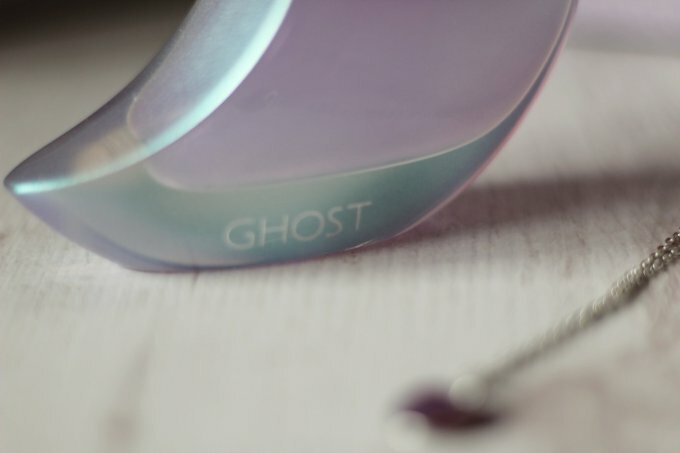 Anything sparkly is every girls dream, and Ghost have managed to make a perfume that fulfils this fantasy. 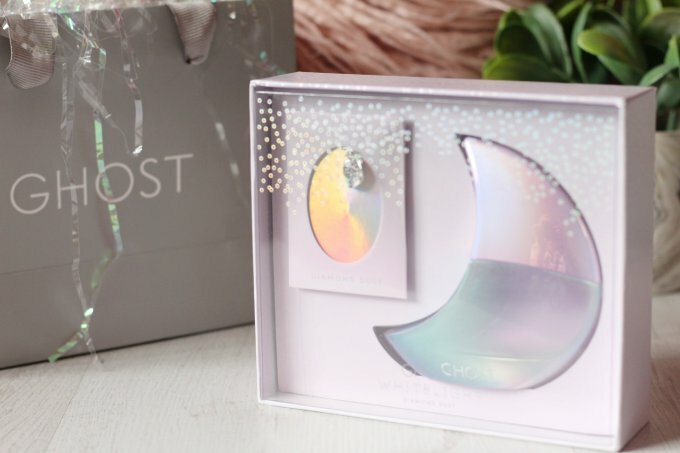 The new Ghost Whitelight Diamond Dust Perfume* is the newest release from the ever evolving Ghost Perfumes and it is the sparkliest one yet. I posted a few weeks back about how Ghost are upping their game with their string of new releases and this one did not disappoint! 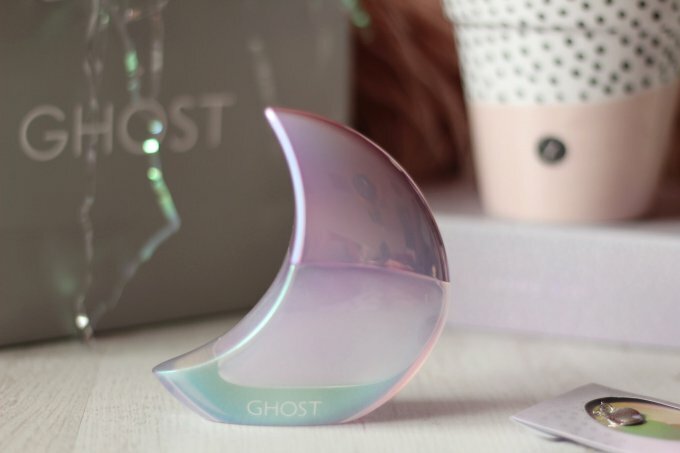 The Ghost Whitelight Diamond Dust Perfume comes in the signature moon shaped bottle first showcased by one of Ghost’s original scents Deep Night. 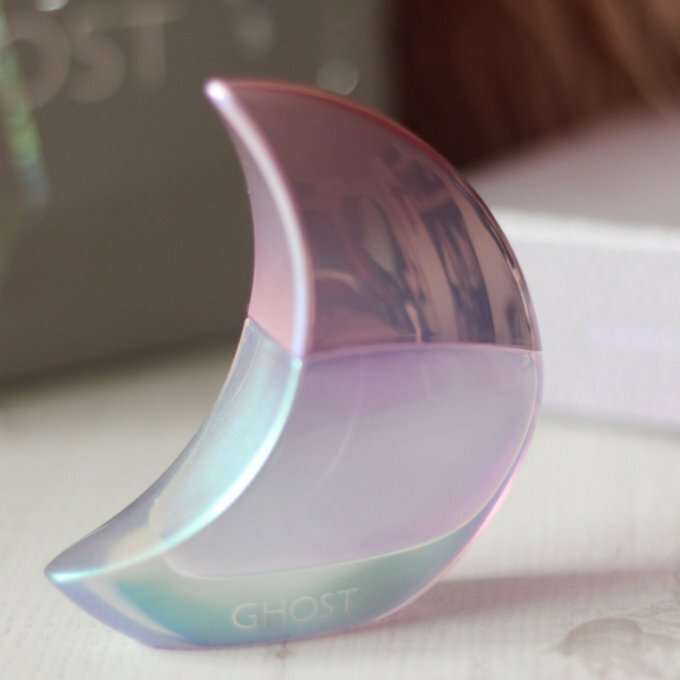 The moon has had a makeover for Diamond Dust in the prettiest iridescent lilac. Half of the moon lifts off to reveal the silver spray mechanism topping off an iridescent glass bottle housing the sparkliest liquid you ever did see as the perfume contains glitter particles so the scent sparkles on your skin. This was one of the prettiest PR packages I’ve ever received – the perfume came in a gift box with a little curled edge coin necklace inside a Ghost gift bag topped with iridescent confetti string. I was in awe when I received it and felt so grateful to have been gifted such a lovely package. The overall scent is floral created using top notes of peach, mandarin, pear, heart notes of jasmine, violet, rose and base notes of patchouli, vanilla and amber. My favourite scents tend to be sweeter but floral fragrances come a close second and I would describe this as more of a fresh floral scent which is a great day time option. The glitter particles are very sublte on the skin and create a nice subtle sheen, so don’t be alarmed if you were thinking you would end up looking like a vampire in the sunlight from Twilight! (if you don’t know what I mean, Google it!). 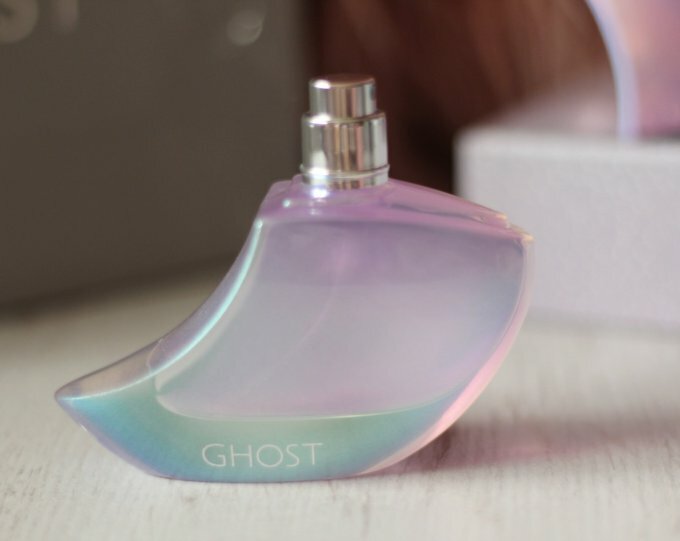 As far as I can see this is only available from the Perfume Shop and for 30ml you pay £27 which again is a another reasonably priced perfume from Ghost. The target audience for this is again I think the younger generation but my Mum really liked the smell of this as well so in my opinion it’s a great option for all ages! Have you tried the newest offering from Ghost? What did you think? Let me know in the comments below! Oh my gosh, this is the prettiest perfume bottle I’ve ever seen. Now I’m curious to smell this myself.